Business thank you letters are used as valuable tools in corresponding with current or prospective clients and employees that can lead to increased sales and referrals. In this world of emails, chats and mobile phones, letter writing is becoming a lost etiquette. Business thank you letter samples can be used as guidelines to format your own personalized business note. Consumers tend to prefer businesses that connect personally with them. A smile, a kind gesture and a word of appreciation go a long way in building business relationships. Words create relationships. The power of words, that make you feel like a valuable person, cannot be emphasized enough. Words such as," We value your time," “We value your efforts," and “It was a pleasure to meet with you," are powerful business tools to establish long-term relationships with customers. To build consumer loyalty, businesses should take time to reach out and get feedback from them. 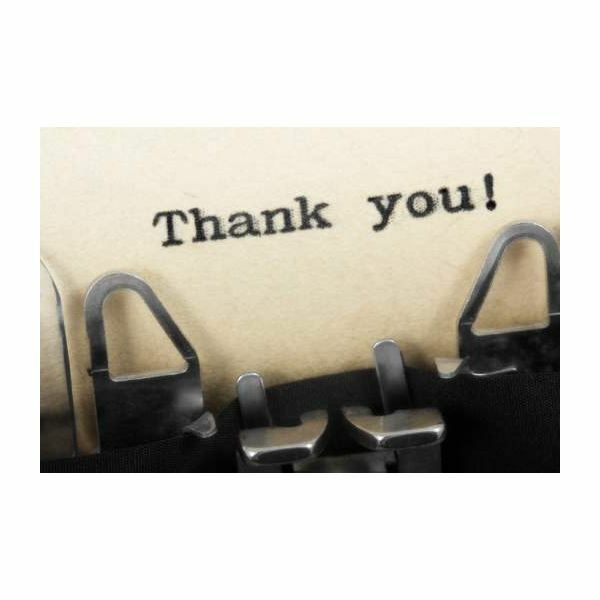 The business thank you letters become very personal and they build a stronger bond with the writer and the reader. A customer tends to do business with someone who takes a personal interest in them. Business thank you letters build and open communication links between the company and the client. It sets the stage for future business promotions and exchange of ideas that are mutually beneficial. A letter that follows up a meeting is a secret marketing tool. It builds a wider customer base for a successful entrepreneur or a company executive. Use premium brand of paper and envelope for your letters, to reflect your impeccable standard. Thank you for your purchase of Canon HD10 HDD Camcorder, which is a welcome addition to Canon’s range of exceptional products with stellar architecture. Thank you for providing us with the opportunity to serve you. We are the sole distributors of Canon Products in Hamilton with convenient branches and service centers in many locations. Do visit our website for all information, related to our stores, products and services. Do contact us, if you need our assistance in the future. We are looking forward to serving you, for all your needs in photography. P.S., Do take advantage of our store membership card for further discounts on all products available in our store. After a business transaction or a meeting, thank you letters to clients should be sent as early as possible. You can use innovative ideas in writing those letters. Customers appreciate companies who support charities and environmentally friendly products. Advertise your involvement with the charities on your business thank you letter. You will be helping worthwhile projects by increasing awareness, and it sets a higher standard for your business too. Your business will come across as socially responsible and committed. We were honored by your kind referral about our services to your employees at a business meeting. A few have placed orders with us. May we take this opportunity to whole-heartedly thank you for appreciating our store? You will be delighted to know that we are opening our branches in Dundas and Freelton to better serve our dedicated customers. Thanks again for your valuable support. Thank you for the excellent job that you have done for the two-week long Marketing Blitz. You led your team to excel in sales and customer service. With your impeccable sales strategy and leadership ability, we look forward to working with you on the new projects coming up in the next few months. Thank you for providing us with an opportunity to pave your driveway. Should you have any questions regarding the maintenance and care of your driveway, feel free to contact us. We would provide you with immediate assistance. When you receive compliments on the look of your new driveway, do refer us and send them our way. We value your opinion. Do suggest better ways in which we can serve you. As part of this continuing series on sample business formats, this article on the Sample Format for an Executive Summary and downloadable template can be helpful when corresponding with potential investors.